Even if this might come as a surprise to many, the growing of artichoke is relatively simple to pull through. Whether you start from seed, from young plants, or from rooted shoots, you’ll see how easy it is to grow superb green or purple artichokes. 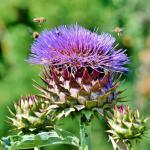 Artichoke can be grown from seed or by transplanting rooted shoots. Although planting from rooted shoots is the most common technique, it is interesting to try sowing from seed. This might come as a surprise, but sowing artichoke from seed is very easy. Begin at the end of winter, from January to March, indoors in a heated greenhouse or simply under a cold frame if your climate allows for it. Sow in nursery pots and transplant as soon as the sprouts have born 2 leaves. Transplant to the ground in the following fall. 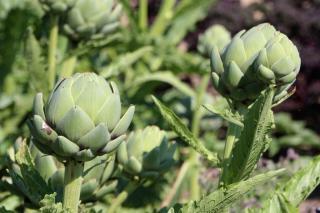 Artichoke is cultivated from rooted shoots collected from older plants, these are small runners that sprout from the base. Rooted shoots are planted in spring or fall depending on when the harvest is planned for and on the climate in your area. It’s usually considered better to plant in spring for areas that have a rather harsh winter, and in fall for areas that have a rather mild winter. If you’re planting in spring (March and April), you’ll harvest in the following summer. If you’re planting in fall (September-October), you’ll harvest in the following spring. Keep a distance of at least 3 feet (1 meter) from one plant to the next to give them space to grow. Exposure must be full sun. Artichoke loves rather moist but well drained soil, full of clay and with a lot of humus. Provides a hefty dose of fertilizer or compost when planting. They must be sheltered from the coldest winds in winter. Artichoke is a plant that can survive for several years in the same spot, as long as it is well protected against freezing in case of frost spells. 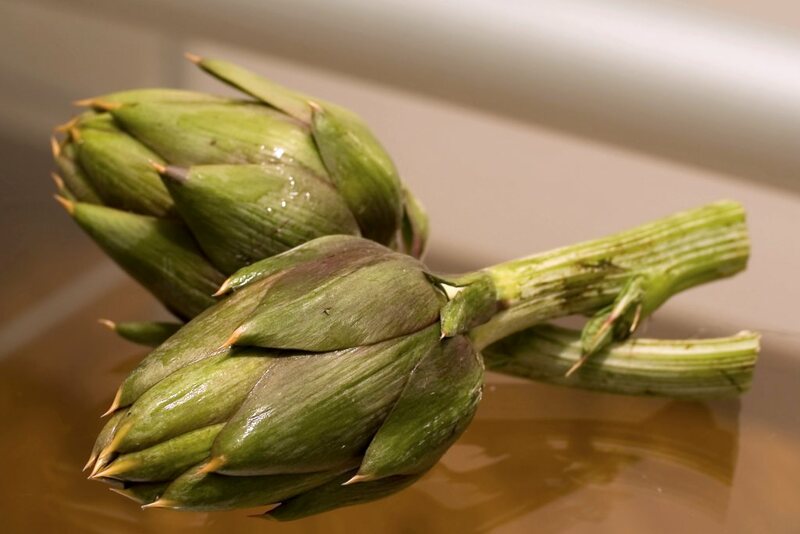 The hardiness to freezing of artichoke goes down to 23°F (-5°C). At the onset of winter, ridge the base of your artichoke plant. Cover with dried leaf mulch to keep it from freezing. In spring, pull back the ridge, weed, and add fertilizer to the base of the plant. Artichoke needs water, and quite a lot of it, but they also dislike excessively wet soil, especially when water stagnates and the roots start rotting. The solution is to water regularly but moderately. Avoid getting the leaves wet when watering so that you don’t invite diseases such as downy mildew in. Artichoke is a vegetable that is rather easy to grow, even though it is vulnerable to several diseases and parasites such as downy mildew, powdery mildew, caterpillars, aphids and ramularia. We recommend treating at the beginning of the growth phase with a fungicide (bordeaux mixture) to avoid downy mildew and renew the spraying after wet rainy days. 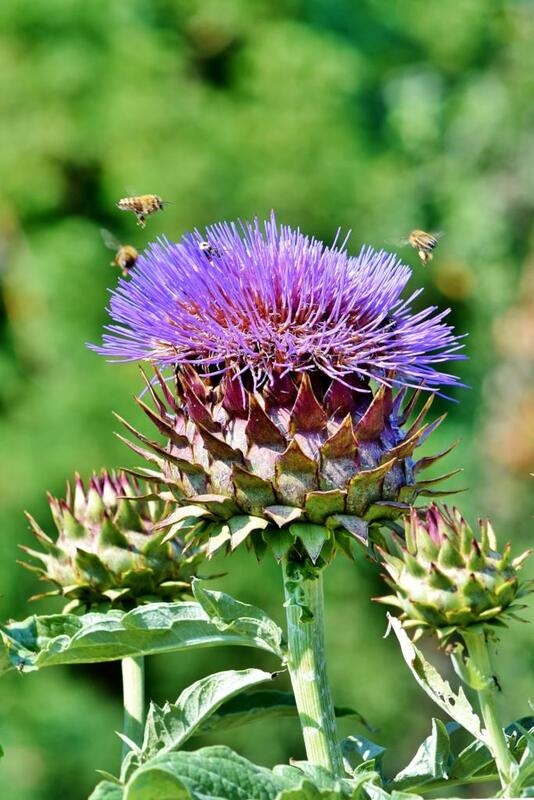 Also take note that artichoke is a favored shelter for caterpillars and snails and setting traps for these could be smart, because damage can be extensive. As for the other diseases, there are ways to naturally treat against powdery mildew, blight, caterpillars and black aphids. Cut the heads together with about 6 inches (15 cm) of the stem when you feel they’ve grown large enough. Best is to harvest them before they flower, when the heads are still tender. If artichoke is harvested too late, a blue flower appears. A good way to determine if the time is right is to look at the scales on the head. Artichoke is ripe for harvest when its scales break when you try to bend them back. 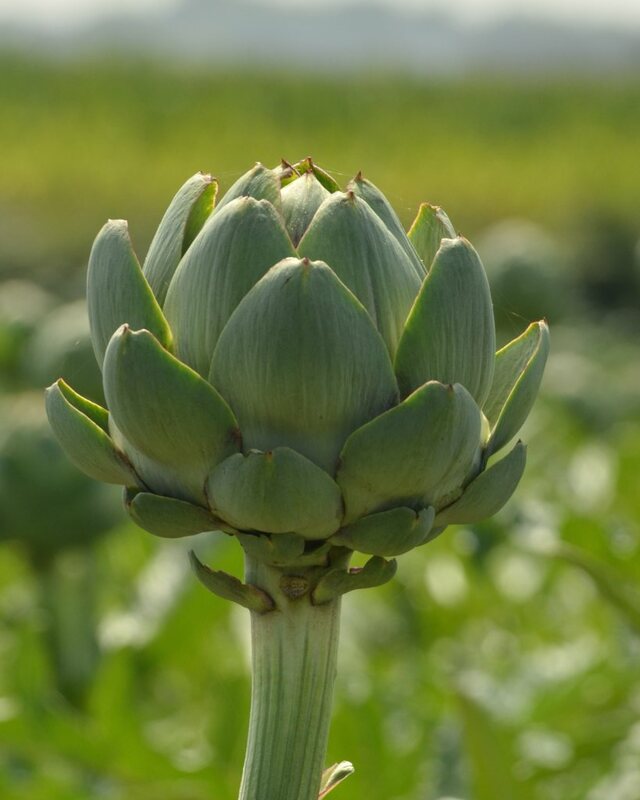 One plant generally produces 3 to 4 artichoke heads in the 1st year and 6 to 10 in each of the following years..
After 3/4 years, it is best to replace the stock because the harvest starts dwindling. Before the first frost spells, it is best to protect your artichoke well from the harshness of winter. Cut back to the base all the stalks that have born artichoke heads. Cut the tallest remaining stems back by half. Keep the smaller stems as is, those that don’t exceed 8 to 12 inches (20 to 30 cm). Bring up around the foot of the artichoke a ridge of soil about 8 to 12 inches (20 to 30 cm) tall, all around it. Cover everything with a thick layer of dead leaves. Remove the dried leaf cover at the end of winter to reveal the leaves. At the beginning of spring, pull back the soil ridge that served as a cold barrier to protect the plant. Cut the branches at the base to keep only the 2 or 3 most vigorous stems. ‘Gros Vert of Laon’ for cooler regions. ‘Voilet Hatif of Provence’ for warmer regions. ‘Vert de Provence’ produces a small green head, delicious when eaten raw. ‘Gros Camus of Bretagne’ is vigorous, round head, semi-hardy. ‘Romagna’ produces small, purple, pointed heads that are eaten whole. ‘Viola’ violet purple, ornamental, tender savory flesh. There are 2 kinds of artichoke, the green one and the violet one, from which the heads are eaten. Either cooked or raw, they are often dressed with a simple oil and vinegar dressing, but there are many unique and delicious recipes. Artichoke is a vegetable that has a high vitamin C content, and it is an excellent liver stimulant. It is recommended to amend the soil with compost before the planting and to loosen up the soil well.